More than 6,000 pages of reports describing people's experiences with unidentified flying objects between 1994 and 2000 have just been released under a three-year project between the British Ministry of Defence and National Archives. A UFO sighted by Boston and Skegness police, in Lincolnshire, was captured on film. The police reported the sighting to the coastguard, which in turn alerted ships in the North Sea, where a crew reported seeing more UFOs. Simultaneously, an unidentified blip was picked up on radar over Boston. Also included in the latest release is a letter from senior MoD official Ralph Noyes, in which he describes seeing a film of UFOs captured by RAF fighter pilots in 1956. Mr Noyes claims the footage was shown at a secret underground screening arranged for air defence staff at the MoD in 1970. Dr. David Clarke from Sheffield Hallam University, an ‘expert in UFO history’ offers a brief video discussing some of the incidents that are reported. He discusses four or five apparently convincing incidents and debunks each. Perhaps as a concession to fair minded reporting he mentions one case right at the end of the video that has not yet been debunked, but there is something in his description of this sighting referring to a craft ‘shaped like a ‘toblerone’ with rounded edges’ that suggests a somewhat tongue in cheek approach. There is no voice given on the National Archives site for any argument with Dr Clarke’s viewpoint let alone the chance for another ‘expert’ who might choose to highlight some of the as yet unexplained cases or disagree with Clarke’s point of view on the sightings he mentions. A Government institution, the National Archive, that one would expect to be a neutral source of information to the public, is thus presenting an entirely one-sided view as fact. Visitors to the site who are new to the subject will be instantly advised that the tens of thousands of sightings catalogued in the National Archive can be dismissed almost entirely as bearing no relation to any extra-terrestrial phenomena. It is of course the norm that any mention of UFOs or alien visitation is bound to result in a public consensus of raised eyebrows and sardonic smiles. No one likes to be taken for a mug and there is an unspoken implication that anyone who gives this particular subject even the most meagre amount of house room has fallen for a myth on a par with the tooth fairy, perhaps slightly less believable. Unsurprisingly, the mainstream media in the UK and the USA is almost without exception implacable to any serious discussion of the UFO/Alien phenomenon and uniformly places it well into the lunatic fringe. To a certain extent this is understandable as the field does tend to attract a colourful selection of enthusiasts ranging from well meaning acolytes with their heads up in the clouds to downright attention seekers. Somehow the news never reaches them that this lunatic fringe also includes thousands of high ranking military officials, of the calibre of men such as Admiral Lord Hill Norton, Chief Of Defence staff, who affirmed the likelihood of its out of this world nature and Colonel Charles Halt, Deputy Commander of a US nuclear air base in Rendlesham England, who has witnessed and testified to the genuine nature of the phenomenon and its lack of a confirmatory explanation to this day. 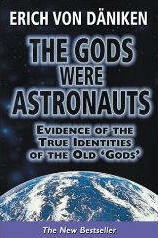 Gordon Cooper US astronaut is also a witness as are several US and Soviet astronauts, 7000 airline pilots, thousands of navy personnel and over a hundred air traffic controllers from all over the world who have also testified to genuine and unexplainable sightings of UFOs and USOs (Unidentified Submarine Objects). These men, with their high level of training as observers would, one would have thought, be expert enough to know and distinguish terrestrial from extra-terrestrial phenomena. It is a world sized disgrace that liars and cheats are made of thousands of sincere witnesses who provide much needed compelling evidence that the phenomenon is real and deeply troubling to millions of people. The arrogance and diffident attitudes towards the UFO phenomenon of a particular cartel of scientists and ‘rent a sceptic’ debunkers are too often the final verifications accepted by mainstream reportage. The profession by its very nature that is most wrong in things as they finally turn out are unquestionably scientists, yet we tend to believe what they say with nary a quibble. Funny isn’t it. It beggars belief. 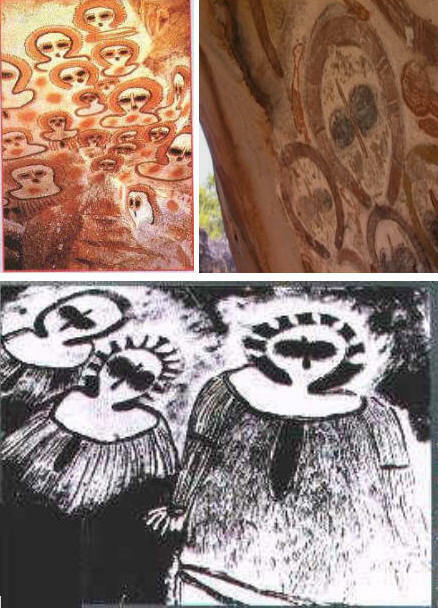 Petroglyphs on sedimentary and granite rock, such as those above, clearly show figures that are identical to the Grey aliens that have been reported by thousands of experients. 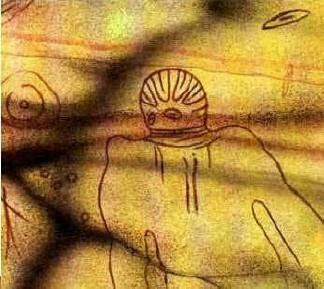 These are ancient cave paintings of Australian aborigines. Some of them are estimated to be five thousand years old. 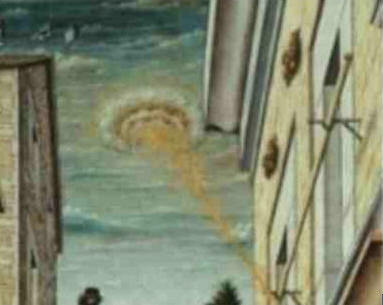 Above is a section of a painting by Carlo Crivelli (1430-1495) called "The Annunciation" (1486). A disk shaped object is shining a pencil beam of light down onto the crown of Mary's head. If indeed we are subject to visitation by extra-terrestrial entities why are they choosing to keep the reality of their existence as elusive as they can? Furthermore, how is it that they are so amazingly successful at doing so without collusion with national governments? If as the evidence suggests this is indeed a genuine phenomenon then efforts to keep this knowledge away from the public have resulted in an unmitigated success by governments and the authorities supposed to deal with them. Despite all the evidence to the contrary the control mechanisms that run the world’s mainstream media outlets have without exception managed to relegate the alien phenomenon as far into the outfield as it is possible for it to go. Why? How is it possible that liars, cheats or fools can be made of thousands of sincere witnesses who provide much needed and compelling evidence that the phenomenon is real and deeply troubling to millions of people. Yes the numbers now run into millions. The arrogance and diffident attitudes towards the UFO phenomenon of a particular cartel of scientists and ‘rent a sceptic’ debunkers are too often the final verifications accepted by mainstream reportage. Whilst reliable witness testimony is plentiful and is in its own right a powerful verification of the reality of the phenomenon there is no denying that hard physical evidence of the phenomenon is hard to come by. But whilst sceptics shout ‘where is the evidence’ it is not beyond the realms of imagination that there could well be an organised response from within governments to hide all the verifying evidence as soon as it appears. There are numerous reports, many of which come from the same reliable sources mentioned earlier, of exactly this. Disposal squads arrive quickly on the scene of a crashed craft and witnesses are instructed, often under threat, to say nothing of what they have seen. 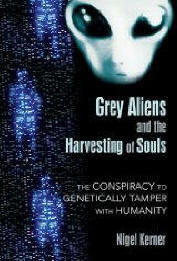 Mainstream science lies at the opposite extreme to the alien phenomenon in terms of consensus view. We are encouraged almost from birth to accept scientific understanding as the last word on reality. Strangely the profession that is so often proved wrong in the end - scientists, are believed with nary a quibble. As Galileo and Pasteur exemplify, the scientific establishment is quick to relegate new ideas to the loony bin. Arthur Schopenhauer so rightly said: All truth passes through three stages: First, it is ridiculed; Second, it is violently opposed; and Third, it is accepted as self-evident. Many scientists think it is impossible for anything—let alone an extraterrestrial alien—to traverse the vast distances of space to get here. The reasoning goes that nothing in the universe can travel faster than the speed of light, 186,000 miles per second per second. The nearest planet detected thus far is about 10 light years away. If we were to travel to this planet using our present relatively primitive rocket technology, it would take us about 350 million years to get there. Einstein’s famous equation E = mc² implies that even if we could travel at the speed of light, as we approached that speed, our mass and that of the spaceship we were travelling in would increase to infinity. It is plain to see that this would be out of the question. So the laws of physics appear to negate the possibility of our ever being able to reach anywhere habitable or vice versa. However, Ian Crawford of University College London says that, “contrary to popular belief, faster-than-light speeds are not explicitly forbidden by special relativity.” He points out that there are a number of concepts that aliens might use to defy the speed of light. For instance they might use “wormholes,” shortcuts through space/time created by the natural design features of the universe. Space, it seems, is elastic. You can stretch it or even tear it. It is claimed that it is not beyond the realms of possibility that space can be folded. If two points in elastic space can be moved closer together, then travelling enormous distances across the void would not be necessary to get from one place to another. “The mere fact” that to travel faster than the speed of light “may be permitted by the laws of physics means that it might just be possible,” says Crawford. World renowned physicist Dr. Michio Kaku warns that the chances are that any alien life advanced enough to reach our planet is likely to be predatory in nature. He argues that human beings as the top of the food chain on this planet are predators and any intelligent life form, especially one that is capable of the advanced technology necessary for space travel is also likely to be predatory. Interestingly, he believes that it would be folly for Governments to make knowledge of such visitation public owing to the panic it would cause. What an unmitigated presumption this implies. If the evidence is as real as the reliable witness end of the spectrum suggests would you not want the right to know about it? Common to almost all abduction reports is the kidnap of human victims, the removal of sperm and ova and the conducting of painful invasive surgical procedures with complete disregard for human pain and discomfort. Children are by no means exempt from these assaults, assaults that are so horrendous that many suffer the aftermath over several years. The apparent focus on the human reproductive capacity would imply that this is a phenomenon that might have profound biological implications for our species never mind the trauma faced by those who experience it. If there is any chance that we are to any extent the victims of an external power seeking to manipulate us for their purposes and not ours is it not crucial we take a more serious look at the whole phenomenon? From a firm sceptic I have changed to a firm believer in this premise after twenty years of dedicated research into the phenomenon. There really is a huge case to answer. A handful of cases possibly linking the MMR vaccine with autism led to millions of parents understandably refusing the vaccine for their children. A rare side effect of aspirin inchildren has led to the medicine being banned for children under twelve. Yet despite volumes of evidence from reliable sources about alien interference and sometimes even assault on our species, we are not motivated to look further. We are not stirred even with the curiosity to seriously and pervasively explore the subject. We are happy to allow our media to sweep the whole subject under the carpet. Why is this so? I can’t help feeling to paraphrase Shakespeare in Hamlet that ‘there is something deeply rotten in the state of Denmark’ when it comes to looking meaningfully at the UFO phenomenon. You can include the USA and the UK as two of the main players in that rotten state of things. But then with the lies perpetrated by both governments to bring about the Iraq war is it any surprise. Their callous misjudgements and devious wranglings have claimed hundreds of thousands of innocent lives. Would you blindly trust them with the lives of millions of our children if the UFO phenomenon turns out to be true and predatory extra terrestrial entities are creeping and seeping their way into humanity for their own purposes and not ours?